Season 3 of The Walking Dead will be filming again in Coweta County, and people are reassured they are safe from zombies. Starting in May, AMC will continue the series with a lot of the filming happening right in Senoia, Georgia. Senoia has been featured a lot in the hit series and it looks like they will continue to stay right there. According to Times-Herald, Mike Riley and Seth Zimmerman recently attended a city council meeting to inform them that AMC will film there throughout 2012, and possibly into 2013. Mike Riley who happens to the location manager , said the following. The cast and crew is set to begin arriving soon, with filming starting around May 31st. The first episode of season 3 will begin with 8 days of filming. Some of it will happen during the day, while some at night, with most of the filming happening during the weekdays. The crew will once again be challenged with controlling the traffic, as well as the fans who will be dying to catch a view of the action. 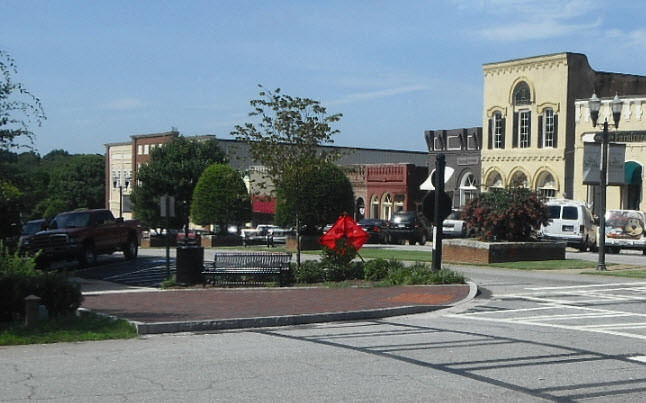 The Walking Dead has its main studio at Raleigh-Riverwood, and the Senoia community is not new to filming in the area. “Fried Green Tomatoes” and “Pet Sematary 2” have both seen action in Senoia, along with some other television shows. The Walking Dead is one of AMC’s biggest hits and is breaking records for the network. We can expect the amount of fans to grow and the intensity to increase. Season 3 is expected to be huge, especially after the season 2 finale, where we witnessed the introduction of fan favorite Michonne. The group is now off the farm and appears to be heading to the prison. Hold on tight, because season 3 of The Walking Dead should knock fans off their feet. In a separate article, the filming location was said to be “governed” by a dictator. Woodbury anyone? I am dissapointed of the things going on in the finale of season 2… Things changed and I don´t like this new direction. And I never wanted Michonne on the show. I know she´s famous on the comics, but I don´t read them…. You’re crazy. Michonne is badass. Are all of you replying on this board educated? Dany, you better be really young, because you write like a hard. Let me expound on this season of WD 2 I thought it was alright but woody drop the ball on the hold season he could have spice it up a bit more zombies would have help on each seen less drama about the crew i can already see what going to happen next season more drama less zombies oh well same old same old oh they found a new house a prison the crew should be save and sound their right woody !! we will see just saying. If season 3 plays out like the commic does there is going to be drama but a hell of alot of zombie kills, i would say 4 or 5 times as many easly. Joneflor, you sound like a tard…just sayin’. ?woody drop(DROPPED) the ball on the hold (WHOLE) season he could have spice (SPICED) it up a bit more zombies would ha /I won’t even start on the grammar. I can’t wait to see the new season. The walking dead is a terrific program that I just happened to stumble upon one night when there just wasn’t anything worth watching. Richard t. Pompano beach, fl. Does anyone know how to be an extra? I live in Georgia and my 11 year old son and I are big fans and would like to be extras this summer. try “extras casting atlanta” on fb.